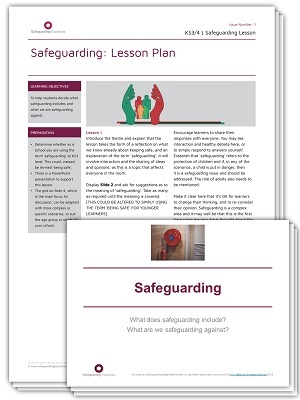 Written by teaching professionals with expertise in safeguarding and e-safety, these lesson plans help to enrich your curriculum, and can be delivered through PSHE, citizenship or ICT lessons. 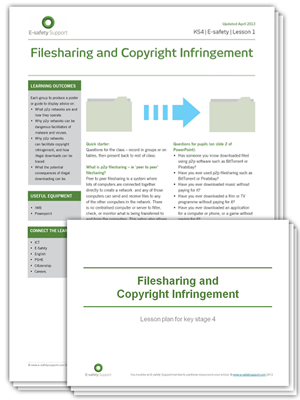 They include PDF lesson plan overviews and PowerPoint slides, and can be delivered by non-specialist teachers. The lesson plans are designed to encourage pupils to create their own resources for safeguarding and e-safety, to input into the school policy and to promote peer mentoring. 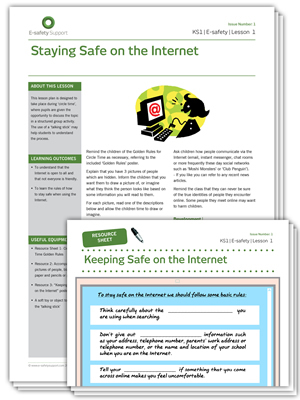 This key stage 1, primary circle time resource allows teachers to focus on developing children’s awareness and knowledge of staying safe whilst using the Internet. 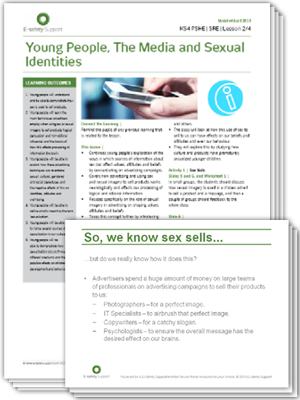 The resource engages with the primary PSHE curriculum and teaches young children that there are adults, using the Internet, who pretend to be children to form inappropriate relationships with them. 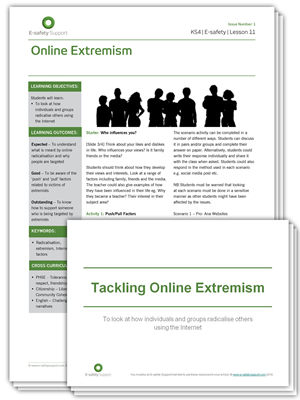 Through engaging exercises, the circle time activity offers advice and explanation about staying safe whilst using the Internet without frightening primary-age children. The activity concludes with the children developing their own set of rules and turning them into a poster. 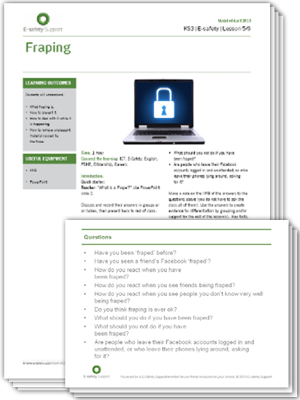 This activity reinforces what they have learnt and allows them to recall the rules of safe Internet use when they are using the Internet at home. 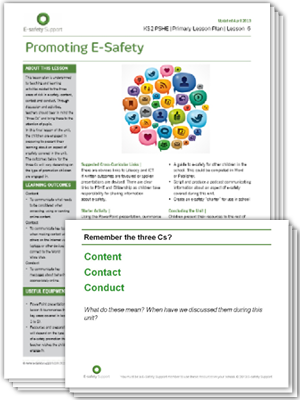 This key stage 2 lesson plan is underpinned by teaching and learning activities related to the three areas of risk in e-safety: content, contact and conduct. 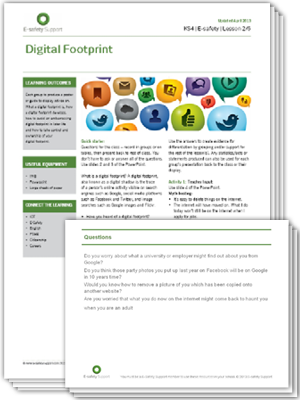 Through discussion and activities, teachers explore the range of ways in which content can be shared via the Internet, specifically mobile devices. 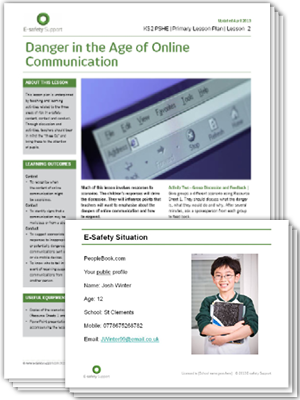 The lesson helps children understand how Wi-Fi and 3G- or 4G-enabled devices offer a range of ways to communicate with others and receive communications, and identifies the advantages, disadvantages and dangers associated with online communications while suggesting ways in which risks can be minimised. 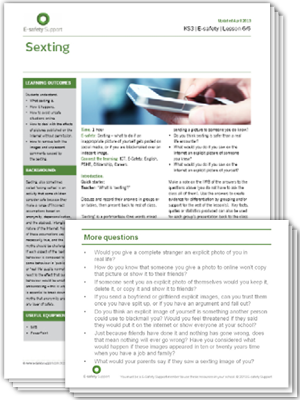 The lesson also covers what is meant by communications ‘going viral’ and how this applies to text or multimedia messaging. 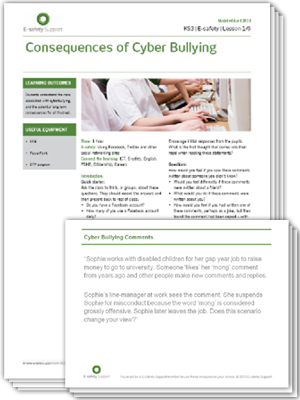 In this lesson, key stage 2 children use a range of e-safety scenarios to help them recognise when the content of online communication might be suspicious and to identify signs that a communication may be malicious or from a stranger. 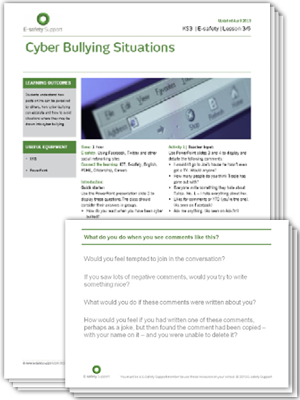 The children are encouraged to develop their own suggestions for responses to inappropriate or potentially dangerous communications sent online or via mobile devices, and for understanding who to tell in the event of receiving suspect communications from another person. 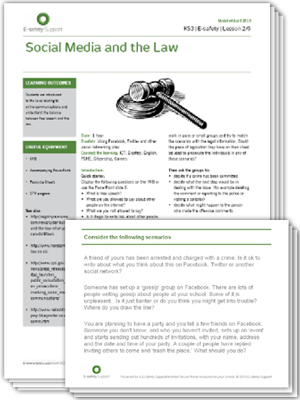 The lesson includes a resource sheet with scenario cards to cut out and distribute to children working in groups or pairs, and scenario worksheets. Research shows that many children play console or online games and watch films that are classified as being suitable for older users. This lesson is designed to help children make more informed decisions about the games they play or the movies they watch. What are classifications and how do they work? 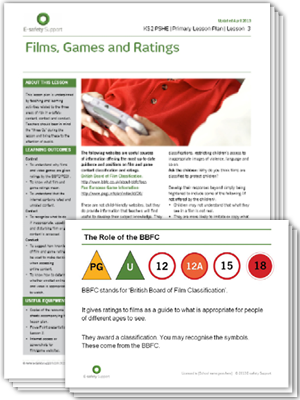 What is the difference between movie and gaming classification systems? 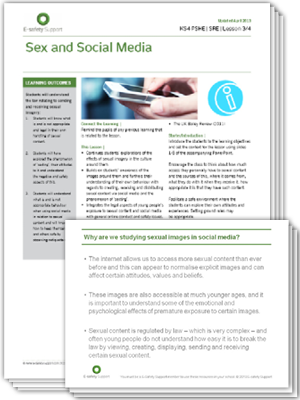 The lesson also tackles the issue of how to assess the risk of watching unrated video online, and how children can deal with something they have seen that upset them. 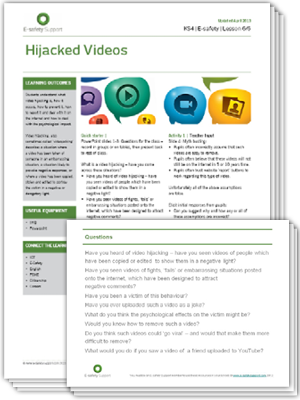 The key stage 2 lesson includes links to relevant multimedia online, so will work best if you are able to use a whiteboard or projector. 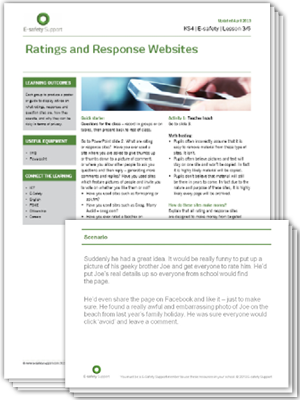 The ability to evaluate websites for their validity is highly important as children increasingly turn to online content for research purposes. 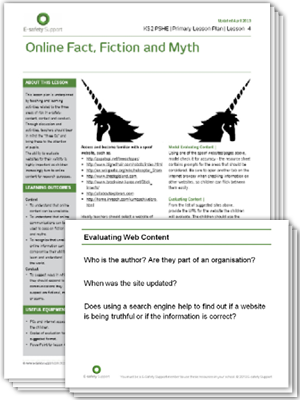 In this lesson children understand that online content can be unreliable, and it can be used to pass on fiction and myths. The children use an example of a spoof website to help them identify suspicious information. Unreliable online information can compromise their ability to learn and understand the world, so it is important that they learn how to spot it, and check data. 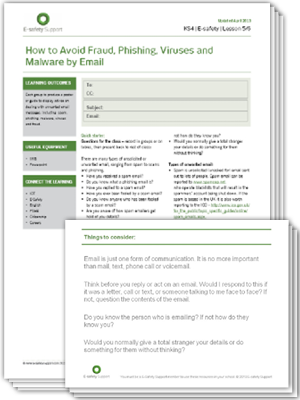 The lesson also explores how to spot scams or fraud, and what to look out for. 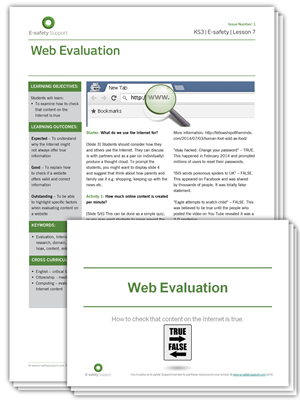 Included in this KS2 resource are a PowerPoint presentation and a website evaluation form template to be used by the children when examining online sources of information. Primary Lesson 06: Copying it - Right? 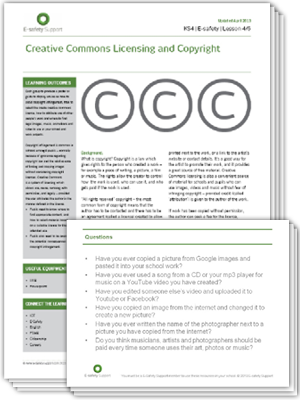 Anyone who has seen children merrily copying and pasting images from the Internet into their homework or searching Wikipedia for information on a topic, knows that knowledge and understanding of the concept of copyright needs to be absorbed very early on, to prevent plagiarism incidents at secondary school or university. 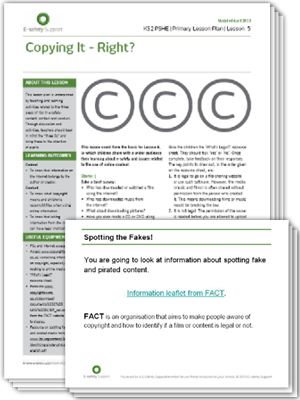 As well as understanding that information online is not always correct, children also need to know that websites and the content of websites are protected by copyright, in just the same way as books are. Young people need to understand that taking information from the Internet can have legal implications and puts individuals at risk of breaking the law. 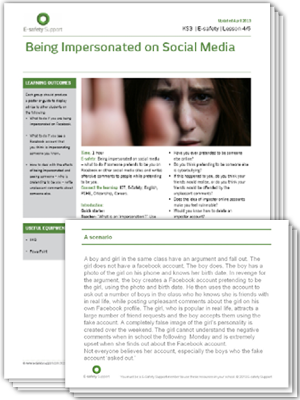 This KS2 lesson could form the basis for the next lesson, where children share their learning about e-safety and issues related to use of online content with a wider audience. 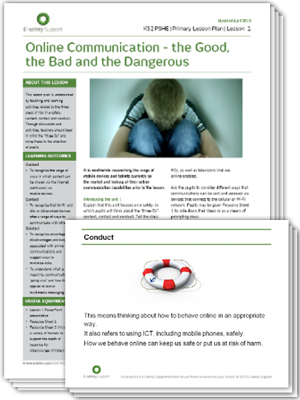 It includes links to useful websites that can help with this potentially complex issue, a PowerPoint presentation and resource sheet. This lesson gives key stage 2 pupils an opportunity to collate all their online safety learning from previous lessons, all their e-safety knowledge, and create a display, presentation or factsheet summarising their knowledge for the rest of the school and potentially their parents too. You could use the key messages from this session to create an e-safety charter, which feeds into the schools e-safety policy, which is “good or outstanding” practice according to Ofsted. In this assembly designed for key stage 1 and 2, children will learn to judge what kind of physical contact is acceptable and comfortable or unacceptable and uncomfortable. They will also learn how to respond (including who to tell and how to tell them).